Thanks to its facelift, the Lada Granta climbs back up to the #1 spot at home. New car sales in Russia end a streak of 16 consecutive months of double-digit gains in September, gaining “only” 6.2% year-on-year to 157.371 registrations, leading to a year-to-date volume up 14.9% to 1.297.432, both results being the highest since 2014 (197.233 and 1.779.947). Homegrown brand leader Lada (+10%) outpaces its home market to reach 19.8% share, very close to the round 20% it commands YTD, whereas Kia and Hyundai both edge up a slim 1%. Toyota (+48%) is the most dynamic marque in the Top 10, climbing up to #4 overall for the first time since January 2017 and knocking Renault (-18%) down to #5. Skoda (+34%), Nissan (+18%) and Volkswagen (+16%) also vastly outperform the market in the remainder of the Top 10. Below we find a long list of great gainers including Jeep (+146%), Genesis (+118%), Honda (+108%), Mitsubishi (+75%), Suzuki (+48%), Infiniti (+33%), Subaru (+29%), Volvo (+28%), Land Rover (+27%) and BMW (+25%). Chinese brands continue to push forward – with the exceptions of its 2 best-sellers Lifan (-8%) and Chery (-14%): Zotye (+189%), Geely (+102%), FAW (+59%), Dongfeng (+52%), Haval (+37%) and Changan (+28%) post very dynamic results while still all remaining below 0.3% share. 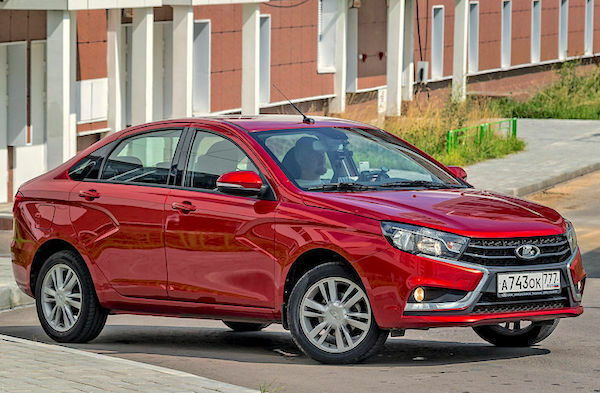 The Lada Vesta is now #1 year-to-date in Russia. We have an unexpected leader in the September models ranking: the Lada Granta (+9%) puts an end to 3 consecutive months of Lada Vesta reign and snapping only its second win in the past 12 months after last December, thanks to its facelift unveiled at the Moscow Auto Show last August. This brings the total monthly wins for the Granta to 41, by far the leader in the list of the most successful Ladas this decade ahead of the Priora (12), Kalina (11), Classic (6), Vesta (4) and Samara (3). 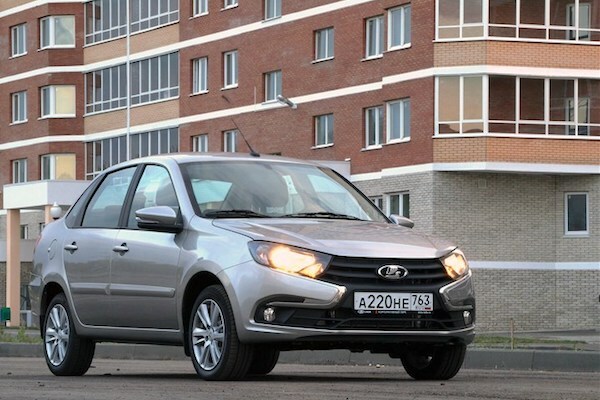 Among foreigners, the Kia Rio has held the monthly Russian top spot 17 times so far (first in November 2014) and the Hyundai Solaris 11 times (first in January 2015). Even though it is knocked down to #2, the Lada Vesta (+32%) overtakes the Kia Rio (-24%) to take the lead of the YTD charts for the first time so deep into the year. If held until the end of the year – which is likely – the Vesta would become the first Lada to make it to the annual #1 spot at home since the Granta was the best-seller in 2015. 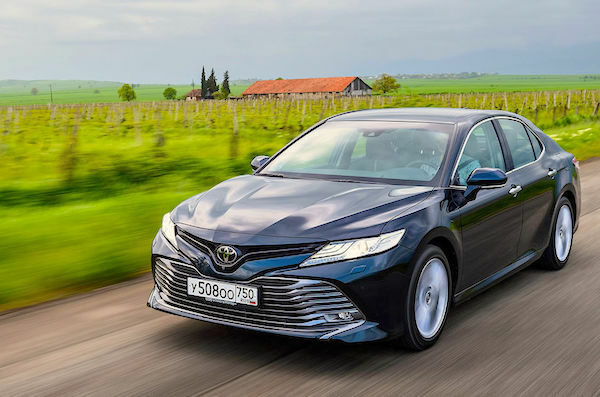 The new generation lifts Toyota Camry sales up 61% in September. The Hyundai Solaris (-4%) and Creta (+1%) round up the Top 5 ahead of the VW Polo (+12%) but it’s below that the gains are the most spectacular. The Toyota Camry (+61%) and RAV4 (+58%) post the largest improvements in the Top 10 just above the Lada Largus (+47%) reenergised by a SUV-looking Cross variant. The 40 year-old Lada 4×4 impresses one more time with a 28% year-on-year uptick, back above the much more modern Lada XRAY (-6%) and snapping the #12 spot YTD whereas it only ranked #16 over the Full Year 2017. The Skoda Kodiaq (+618%) makes its second ever appearance inside the Russian Top 25, improving on the #24 spot it reached last July to #21. The Nissan Qashqai (+53%), Nissan X-Trail (+45%), Mitsubishi Outlander (+35%), Kia Sportage (+27%) and VW Tiguan (+20%) prove the SUV wave is well and truly active and in a majority with 14 representants in the Top 25. Once again, alongside the Camry only the Kia Optima (+50%) manages a significant uplift among sedans. 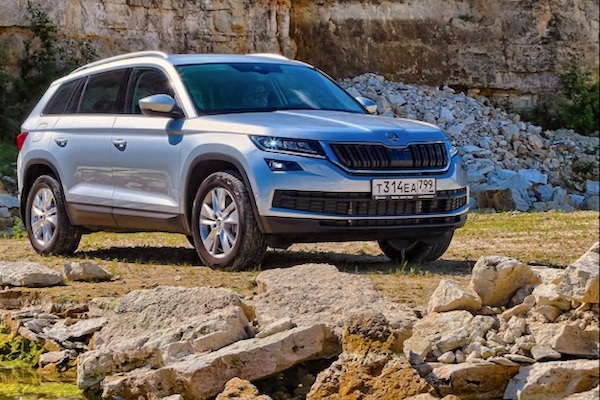 Second appearance of the Skoda Kodiaq in the Russian Top 25. Full September 2018 Top 55 All-brands and Top 25 models below.